For those nights when you don’t want to spend an eternity tracking your target down it’s nice to have a plan that involves one of the brightest objects in the night sky. 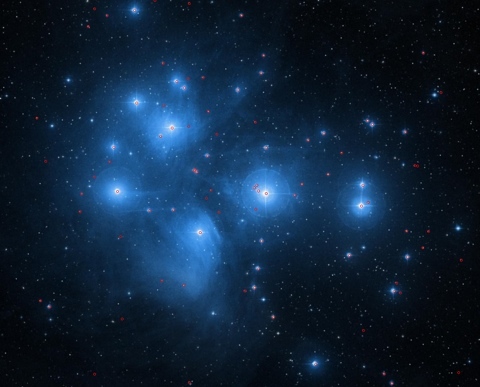 The Pleiades (M45) is handy for just this reason, and armed with a map and some doubles from the Washington Double Star catalogue (WDS) that’s what I decided to do on the night of the 6th January 2015. I’ve included a finder for the stars I visited on this trip below. Please note that both the DSS image above and the chart below have been reversed (left to right) to match the image in my star diagonal. Clicking on the chart’ll give you a better view. First up was a wide (and a lot of the brightest doubles in the Pleiades are) double HJ 3251 AB. It was plain enough to my eye and telescope (a 4” f11 refractor) despite the 11th magnitude secondary which appeared slightly blue. 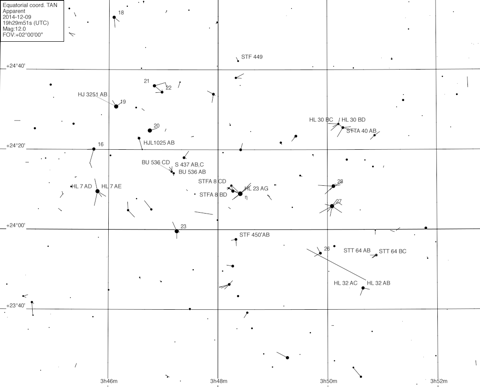 I could find no sign of the nearby HL 9 AC which turns out to be 14th magnitude and probably too faint for my scope. Next up, and separated by 175”, with magnitudes of 7.2 and 9.9 there was no problem with the wide double HJL 1025 at x70 or x114 angular magnification. A little averted gaze revealed two faint components of HL 23 at x70. Both are about the same separation from the primary and quite close to each other, most likely the 11th magnitude H and G components. Another very faint component could be seen on the other side of the primary, which is shared with STFA 8, at a similar separation as long as you’re not looking to closely. I suspect this is the 13th magnitude F component which matches the position in my very rough sketch. Said primary (eta Tau, or Alcyone) is much brighter at magnitude of 2.8, a characteristic it shares with the B, C and D components of STFA 8. All were are very obvious and of contrasting colours (though I forgot to note which). Moving on to magnitude 3.7 17 Tau (aka Electra), and the double HL 7, I could clearly see the widely spaced E component to the north which at 10th magnitude is curiously the brightest of all the components which seems the wrong way round to me. In fact, the B and C components are 13th magnitude, and definitely couldn’t be found. Right in the middle of the main body of the Pleiades is the double S437 AB,C. It’s clear to see in the DSS image above and the C component is easy to split from the primary at a distance of about 40”. The A and B components (BU 536 AB) are much more challenging at less than 1”, needless to say they remained a single entity for me. I noted that the primary appeared blue whilst the C component was yellow which is a common pattern, especially since in this case the primary is fainter than the secondary. I’ve since noticed that the C component also has a companion almost due north in the form of the double BU 536 CD. At 19” separation it might be worth looking for next time, but it’s almost 13th magnitude. On to STF 450 which I thought was a lovely double at x70 and about 6” separation with faintly blue and white components. At this point I surprised myself. Hoping to see another of the rare tighter doubles in the Pleiades I turned to STF 449. The primary was plain enough, but with the sky brightening as the near full Moon rose I didn’t fancy my chances of seeing the 11th magnitude secondary. Suddenly it popped up in averted gaze at x114, and from there stayed put under direct scrutiny only 6.8” away. I moved to STTA 40, where the wide AB double was evident at around 7th magnitude. Also in the same view were hints of a couple of the components of the secondary’s own double, HL 30. I’m pretty convinced that my rapid sketch of this system captures the C and D components of this double at magnitude 12 and 11.5 respectively and nearly the same separation from the primary. By now the sky was getting quite bright and revealing a surprising amount of thin high level cloud. I decided to launch an attempt on a couple more doubles before calling it a night. HL 32 AB is quite bright and widely spaced, as are the AC components. These have the disadvantage of the 12th magnitude brightness of the C component, but I still think I spotted it at x70. I suspect the components of STT 64 were all visible at around 10th magnitude, but by now the conditions were far from favourable, so something for another day. All good fun when you’re feeling a bit lazy, and other than a slight periodic nudge to follow the Pleiades, you hardly need to move the scope all night. Next Next post: Why do I observe?